When you develop an app, you probably have a few parameters that you need to adjust and tweak to find the desired value. The usual approach would be to change the parameter in the source code, recompile and deploy the app to your phone to test it. If you have a lot of parameters to tweak, you probably add a developer GUI to your app that enables you to change the parameters at runtime. Store all parameters you want to edit in an own class, e.g. AppParameter. When running your app in edit mode you will retrieve the values for AppParameter from the database. On your PC you run a .NET application that allows you to edit the database parameters. Reread the values inside your app and test the changed parameters. No need to recompile or even restart you app and edit the parameters from any PC. If you want to use this with your app you only have to change the AppParameter class to contain the parameters you need. However, I currently only support the data format float, Vector2 and int. If you need other formats you need to extend the example. The core class of this project is the ParameterProcessor. It is realized as a singleton and provides the interface to the database. Furthermore it provides functions to create strings from values and the other way round. You will find a lot of similarities to my previous SimpleDB blog post. The class is designed to be used from the PC-Editor as well as from the phone app. Therefore I did not use the Amazon AWS SDK for .NET for the SimpleDB access from Windows, but used the SDK designed for the Windows Phone. For that I needed to create Windows Library Project and add the SDK source files. Compiling and running it from Windows worked smooth with only one exception. In SimpleDBResponsce.cs line 39, the IsRequestSuccessful property for set is declared protected. This caused the XmlSerializer to throw an Exception. Removing the protected modifier solved the problem. Now let us take a look at the code. In the beginning the singleton is defined and in the constructor the amazon client is initialized. Don't forget to enter your SimpleDB keys there. /// Get instance of singleton. The function SaveToDB uses generics to pass the parameter class and instance of which values are stored in the database. The second function parameter is the name of the domain in SimpleDB. The domain needs to be created before. The response handler, which is called after the parameters have been stored in the database, currently does nothing. Using C# reflections the fields of the parameter class are easily iterated through an FieldInfo array provided by the function GetFields() from the Type class. The database then simply stores the field name as an attribute with the field value converted to a string. Additionally I save a time stamp that could be used to check if data has been updated without retrieving all attribute. This could make sense if the data you store is very huge. The complete class values are entered as one item into SimpleDB where the parameter class name is used as key value for the item. By that you could store multiple different parameter classes within one SimpleDB domain. The ReadFromDB function also uses generics and reads the values from the database into the passed parameter class instance. Additionally you can pass an Action delegate, that is called after the data is received. Remember that the database calls are asynchronous, so if you for example need to refresh your GUI after the new values are received, you can use this delegate. The select request retrieves the SimpleDB item with the key value (itemName) of the parameter class name. The request handler then iterates through the retrieved attributes and using reflections sets the values into the fields of the parameter class instance. /// Reads values from a SimpleDB and writes it into a class instance. SimpleDB can only store string values, therefore the parameter class field have to be converted to a string. This is done by the FieldToString function. The current implementation explicitly only supports float, int and Vector2. You can add more types if you need them here. /// Using reflection to get a value string of a class field. valueString = vec.X.ToString(nfi) + ", "
The complement function to the above takes a string and writes the value into the field of the passed instance. Again only float, int and Vector2 is supported here. /// Using reflection to set a class field from a value string. /// Currently only float, Vector2 and int is supported. /// Extend for you needs. Using the ParameterProcessor class you can finally integrate the database access into your application. Just reread the parameter class values at your convenience. You could add an update button, or reread every time you restart a level or even poll at a certain time interval. It is developed using Microsoft Visual Studio 2010 Express, but it should not be a problem to use it in MonoDevelop. I also included the AWSSDKWP7 (SDK for SimpleDB) as Windows binary, so that you can directly start testing. In this post I presented an easy way to tweak app parameters from a PC using a cloud database. This scenario can be extended in multiple directions. 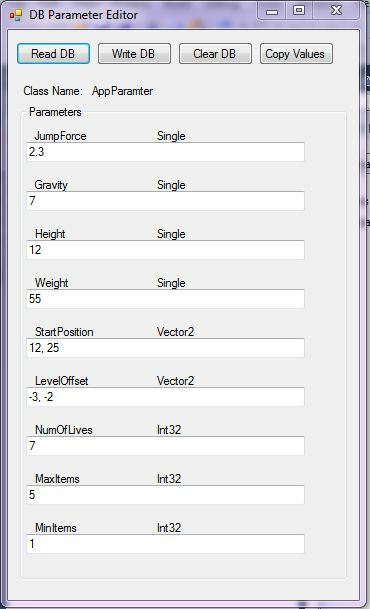 For example you could extend the Editor to become a more flexible game level editor. By that your game and level designers can modify levels on the running application. You could also extend it to be usable with a release version of a game. By that you can make game play adjustments without the need of an update.